This document of the Canadian Conference of Catholic Bishops replaces the former Program of Priestly Formation published in 1981 by the Conference. 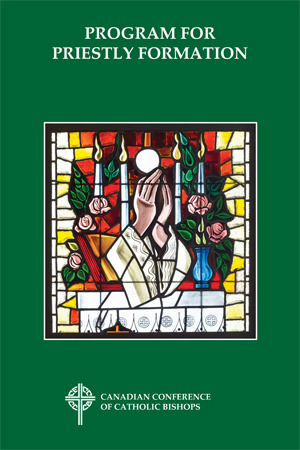 This new program has been approved for a period of two years, after which it will have to be revised in response to the publication of The Gift of the Priestly Vocation by the Congregation for the Clergy (2016). The 2018 Program for Priestly Formation outlines the basic principles and guidelines for the formation of candidates to the priesthood, particularly those called to live their priestly lives as diocesan priests in English-speaking Canada, so they may be adequately prepared to exercise their future pastoral ministry at the service of the Church in today’s Canadian society. It also addresses the different agents involved in each diocese in the work of priestly vocation awareness and preparation for seminary entrance. * This book is free of technical protection measures (TPM), but is still protected by copyright law. For more information, please see the CCCB Digital Rights Management Statement. If you wish to purchase multiple copies of this book, please contact permissions@cccb.ca. You must register and be connected to our website to complete this purchase and download the resource.